Despite the fact that the classical guitar is considered to be the only Spanish acoustic guitar, milestones of its development are deeply rooted in history, embracing the period of hundreds of years. This period is full of myths, conflicting information and interesting facts, to understand which tried many. the First contested fact from the biography of guitar is its birth. So, some historians claim that it was a hunting bow, which was used not only for fishing but also as a musical instrument, could become the first prototype of the modern guitar. After all, what was a pull string instead of one of the few where the difference in length and tension force of these improvised strings easily possible to get a range of sounds. However, most scientists associate the modern guitar "kitara" - ancient Egyptian stringed instrument. But equally realistic is another version, according to which the ancestors of the guitar are a variety of European musical instruments, who so loved to portray the artists of the 10th century ad. But already in the 13th century in the historical documents and essays featured two guitar – Moorish, having a curved body and a variety of decorative holes, and Latin, is much more similar to a modern acoustic instrument. Both guitars already have a sound hole in the elongated body, the neck and the nut under the strings, but the method of attachment of the strings and their number still more. Therefore, the guitar, the former until the 15th century, something like a lute, only in the 16th century a fifth string. A little later, in Germany or in Italy the instrument on the neck will add a sixth, so it will get its final shape and sound. This guitar today, and is called a classical acoustic. the popularity of the electric guitar and its "sister"
Despite the fact that from the very beginning the guitar was used by many bards, as a tool needed for a solo performance of songs, real popularity is as a standalone musical instrument, it brought musicians Tarrega, Segovia and Lobet. Then comes one of the most important milestones in the development of the guitar. Thus, in the first half of the twentieth century came the first sound, followed by the first guitar, which instantly brought an unusual sound in old and new songs, and it gave the musicians a wide scope for creativity. 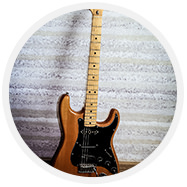 These qualities contributed to the rapid growth of popularity of this guitar, which allowed her to quickly become the Central tool for most modern music, such as rock, metal and pop music. it Also opened the scope for improving the tool itself and highlight the various subspecies, such as the bass or rhythm guitar needed for a more accurate extraction of sounds to certain keys. And this, in turn, made it possible again to enable the guitar to multi-instrumental ensembles and orchestras. Use guitar in their works and musicians from tribute bands. Thanks to all this, the guitar remains popular in our days. An increasing number of people want to learn how to professionally play this instrument and specially attend specialized courses.